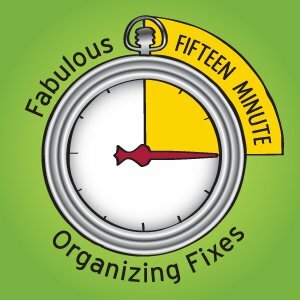 This week, we’re dusting off a blog post from a few years ago, originally titled “How to Organize Your Glove Compartment in 15 Minutes for Under $5.” We hope you love this Fabulous 15 Minute Organizing Fix! Does this look familiar? Not sure? Next time you’re in your vehicle…take a look inside your glove compartment. If it looks like mine did, here’s how you can organize it in fifteen minutes for under $5. First, clear everything out of the glove compartment and load it into a portable storage container. Take your bucket of stuff inside to a flat surface (I used the kitchen table) and sort like with like. 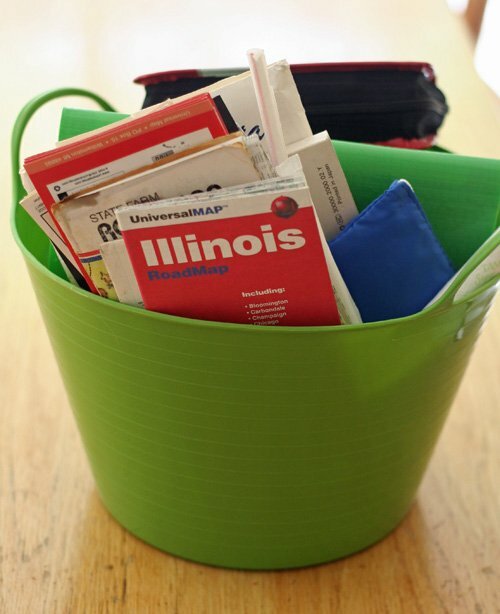 Toss out the things you don’t need (like old ketchup packets) and find a new home for items you need but not in your car. Next, sort and organize any papers you keep in your car. 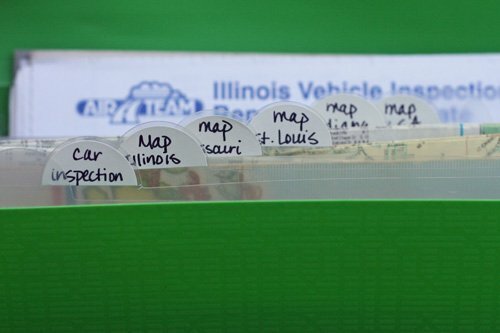 I organized maps and vehicle repair receipts (which I have always kept in my car) and organized these into the small expanding file. The final step in organizing your glove compartment is to put everything back into your glove compartment and possibly elsewhere in your car. Prioritize what goes where based on how important the items are and how often you use them. Here’s how I did it. 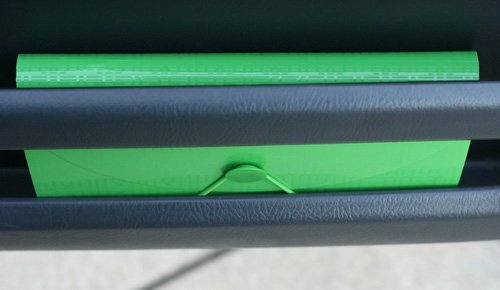 I decided that the items in the expandable file will be stored in a compartment on my door…so that the most used items could be in the best storage location in my car—the glove box. I did not put my registration or insurance documents on the door—they went back in the glove box along with some other items that had been stored in a nice little storage area underneath the passenger’s seat. This drawer contained my Collision Kit from Buttoned Up. Now here’s the funny thing…remember that startling but otherwise uneventful collision I told you about earlier? Well, during the startled moments right after the collision, I didn’t even think about the Collision Kit stored underneath the passenger’s seat. Instead, I called my husband and said “I just got rear-ended. What do I do?” Not the best approach. Had this been a more serious accident where people or cars were more than startled, there are a few things I should have done. My Collision Kit would have walked me through the process. The kit includes (among other things) a clipboard and an accident checklist (which doesn’t say “call your husband and ask him what to do”). So that’s all there is to it! Happy organizing! Writing this post made me really curious about what other people keep in their glove boxes…and if this is a space that you’ve organized recently. 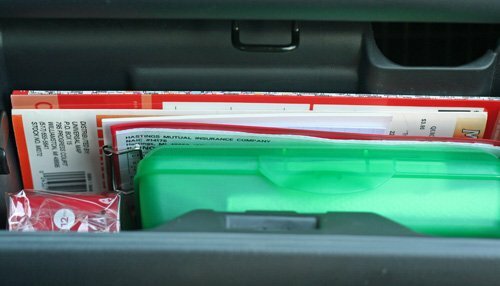 Or is your glove box like mine…a forgotten space? Thanks for sharing! I don’t drive, but the glove box in my husband’s car is a mess. I’m always threatening to tidy it up, but the “system” he has works for him. The one thing that really stood out to me in this post was something you mentioned almost in passing- the disposable camera! Hubby was in a small accident a few years ago (with an uninsured driver- grr!) and could have really used that as evidence. It turned into a “he said, she said” kind of thing and, of course, hubby didn’t get a penny compensation, even though she was at fault. Getting one tomorrow! – A few driving instructions and maps, in a coupon-size poly string envelope. For getting around, I usually just use my iPhone or iPad, or specific driving instructions and maps I’ve printed out for the day. But there are a few I want handy all the time, like information on how to get to the emergency vet; when I’m stressed out, I don’t want one more thing to worry about. And I go there infrequently enough that I always need a quick memory refresher. – A copy of my Advance Health Care Directive. – My registration and insurance info. I just took your idea and moved them from the door pocket to the glove box – so now my glove box has all my important papers. Auto manual, insurance and registration, knife and fork – real ones, and a napkin, and a pen. @ Carin, thanks for your comment! Sorry to hear about your husbands accident. The camera in my glove box was part of the kit from Buttoned Up. It is a great idea and hopefully we’ll never need it. Great idea on the knife and fork Maureen! Love the idea of a pencil box and little file folder. My car could use this stat!! I have a storage box that is built in above my glove box (so I guess I have 2 glove boxes) and I keep a deodorant for both kids (does away with the “OMG what did you roll in during PE!” reactions), a brush, ponytail holders and a couple of clips for my daughter in case she gets into the car for gymnastics w/o them. The papers for the car are in the lower glove box along with my maintenance manual. Then the maps and the mini-print phone book are in the pocket of my door. I’m definitely adding the disposable camera that has been sitting here on my counter next to my computer for a few weeks! The glove box will be a much better place for it! LOL! Because I don’t like to search for things, I have specific places in my car for all the things I keep. Maps go in the pocket on the passenger side, hardly ever accessed. Napkins, which I always seem to need, go in the pocket on the driver’s side. In the console are cassette tapes (no CD player in this car), parking/entry passes and an extra pair of sunglasses. Finally, in the glove box are a first aid kit, notepad, pen, car manual and coupons. I advise clients to keep coupons in the car so that they don’t feel frustrated by not having them handy. my glove box is relatively empty ~ we do a lot of long journeys so it’s used by my passenger / co-driver during these journeys. the regular items are car manuals, notepad, pen, tissues, wet wipes and tyre pressure guage with a note on required pressures. Tool kit, warning signs and first aid, shopper bags, de-icer and emergency oil refil are in the trunk. maps are in the passenger door pocket. vouchers, coins, parking vouchers and entertainment are in the central consol. I like the idea of the collision check list… will look to add this. I may adapt it to add some details as in the UK we don’t carry insurance or vehicle registration documents in the car to help against theft. These are in my central command file back at the house. I have the Honda Manual and service books in the plastic sleeve they came in. And the State farm agent gave us a hard covered binder that hold the insurance card, registration and a check list for what to do in an accident along with other helpful info for if you car breaks down an such. There is also a spot of a tire gage and a pencil. I also keep a flash light in there. The batteries are backwards… just like my dad taught me:) I keep the same first aide kit in there too, with a hotel mending kit and manicure scissors thrown in. I took photos with a disposable camera that was in the car a couple years… be careful the photos I took didn’t turn out. The heat ruined the film. I would just use my phone. I will be organizing my glove box tonight. School starts tomorrow and I keep things in small glove box above the large on for the kids. My teenage boy sits in the front seat. I drive them to school in the morning. My twelve yr old boy sits in the back middle seat, we have a mini van. I keep wisp, for no time to brush teeth emergencies, lip blam, hand lotion, extra pens and pencils, small first aid kit, comb for youngest, he’s all about his hair, just little things to make life easier in the mornings if something is forgotten. Glove compartment is a mess right now. I love the plastic school supply box. Headed out to pick up last minute supples for them and that will be on the list for the glove box. I keep a small bin under the little table in between the two front seats that has cough drops, tylenol, ibuprofen, lotion, trash bags, nail files, and extra cash for lunches. Just a few dollars. I love your tips and will be using some of them tonight. I’ll keep you posted. Thanks everyone for your thoughts! Great ideas here. Danielle, your car sounds really well stocked! Great ideas here for other things to keep in the car. PattiMc, thanks for the tip on the disposable camera. HannahK, I love the idea of adding a note pad…my daughter always wants something to write on while we’re in the car. Marcie, coupons are a great idea, too! Katherine M, the deodorant is brilliant! I think my glove box contains my owner’s manual and many Bed, Bath & Beyond coupons, since they never expire. I also have a parking hang tag in there. I’m almost positive that there are no gloves in it. I don’t think I’ve organized it since I bought the car in 2007! Time to think about doing that. Thanks for the inspiration. I keep the car manual, extra napkins (which always come in handy) a small travel-size lint roller (also very handy at times), tire guage, insurance card, and a 409 wipe in a little packet. Great post! Found this post on Pinterest! 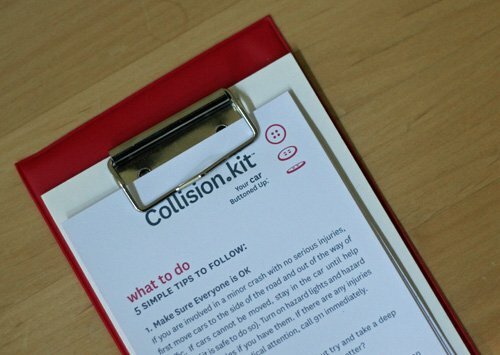 I love the idea of taking the buttoned up Collision kit apart and putting the check list with the insurance and registration. Brilliant! In my tiny VW Golf, the glove compartment space is taken up by an airbag. However, I have storage spaces in the doors (that I think I use pretty well), and a partially lockable tub between the front seats. You’ve inspired me to work on that space. I made up a page w/ all my pertinent driving info already on it, so in the event of a collision, I just hand my info out to other drivers. It’s made the ugliness of a few accidents less of a headache. Thanks for this! I organized my glove box last night with an accordion file. I can’t believe how much room I have in there! I don’t have anything in my glove box as the hinge is broken! That definitely simplifies keeping it organized. 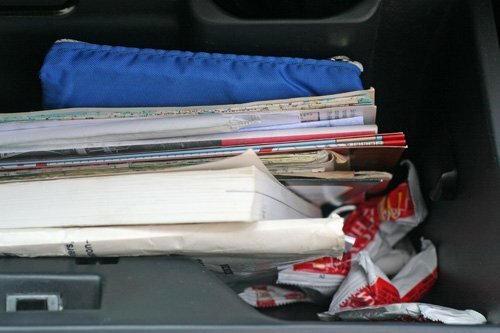 I don’t keep a lot in there (manual, registration, and napkins–insurance stays in my purse) but it’s very unorganized! Thanks for the ideas! 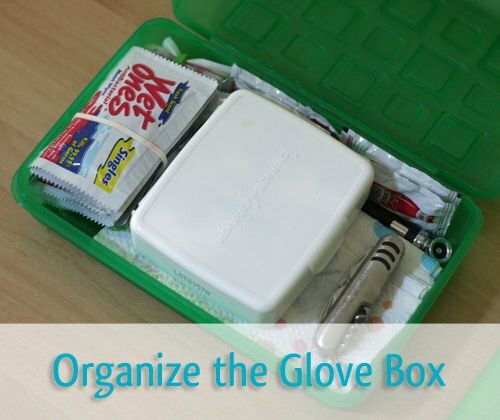 Just wanted to let you know that I came across this post awhile ago and I organised mine and my husband’s glove boxes straight away. It works fantastically! Thanks for sharing. Fabulous Catherine! So glad this is working well for you and your husband! Thanks for letting me know. I just want to point out that heat can greatly damage the emulsion on camera film, therefore a camera that has been stored in a hot glove compartment might not produce very good pictures. I would advise taking pictures with your cell phone’s camera instead. My glove box hasin it: zippered car manual that holds registration and insurance card plus form for accident, 4 in 1 tool to cut seatbelt & break window, small first aid kit, tire gauge, sunglasses, coins for parking meters. And yes my leather gloves are in there too!